Jabal Omar Development Company (JODC) the leading real estate development company in Saudi Arabia, announced today that H Hospitality Collection, the hotel management company of Abu Dhabi Capital Group, has been selected to manage its new 5-star hotel development in the Holy city of Makkah. 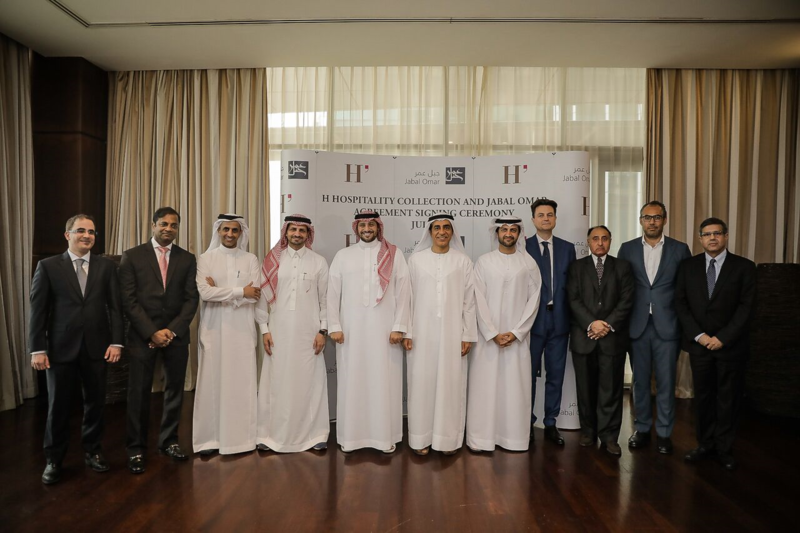 The agreement is a significant milestone for H Hospitality Collection as the new hotel marks its first venture in the Kingdom, underlining its focus on regional expansion. The project has an outstanding location, only walking distance from the Grand Mosque. The hotel is part of the prestigious Jabal Omar mega-development, with a total built-up area of over 2 million square metres, featuring residences, hotels, malls, retail amenities, prayer areas and other facilities. H Hospitality Collection will manage the hotel which will have 650 spacious and elegantly designed rooms, three restaurants offering extensive culinary choices, lounge, café, meeting rooms and a modern gymnasium. The hotel will welcome its first guests by the beginning of 2020. Mr. Yaser F. Al-Sharif, Chief Executive Officer of Jabal Omar Development Company, said: “We are privileged to partner with Abu Dhabi Capital Group, one of the most distinguished organizations that is expanding the footprint of its H Hospitality Collection in Saudi Arabia. The agreement marks the importance they place in operating their first hotel project in the Holy City of Makkah. The proposed H Hotel is situated close to the Grand Mosque and will appeal to visitors from the GCC and across the Islamic world by offering distinctive value propositions that will contribute to our growth. By choosing a brand that has roots in the region, we are confident of delivering a world class hospitality choice to Makkah Visitors”.